i.can’t.handle.it. i LOVE it! 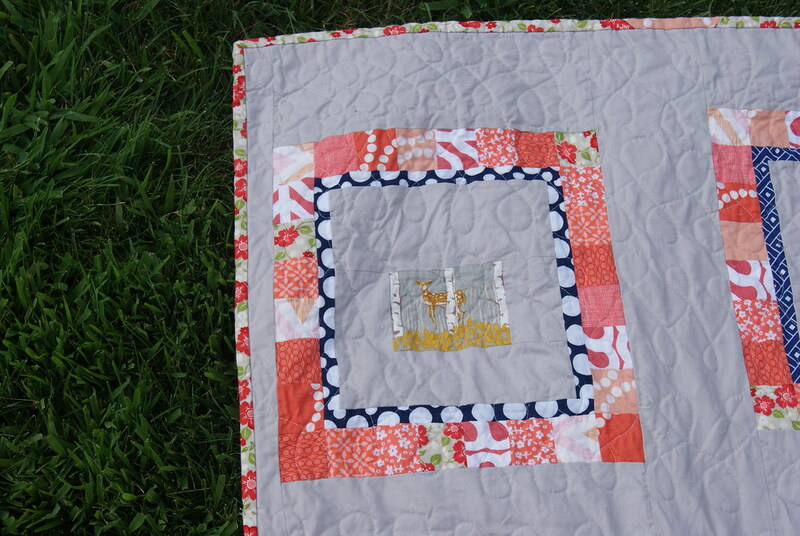 i love the grey, the coral, the navy, the off-centered blocks, the backing. EVERYTHING. 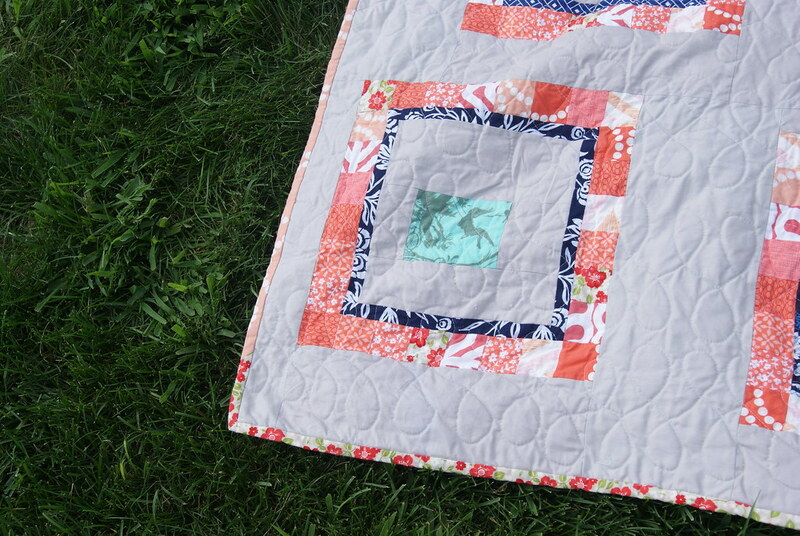 but I especially love the sweet stories about L’s excitement for this quilt. how sweet and heart warming for you! LovWhat a beautiful quilt. I love the unevenly spaced blocks, thatś makes it inte4resting to look at the quilt. Your color choice is perfect! Gingko leaves are easy to draw. Just try it. So it is easy to sew as well. Micro stippling is indeed stippling on a very tiny scale. I even do stippling and McTavish on inchies! I think that is micro? Just perfect! Love the skinny navy borders with the coral patchwork borders. And isn’t so great when the little you’re making it for loves it! Yay!!!!! I am so glad that she loves her quilt! Happy lil one and happy Mom! Such a perfect big girl quilt. Love the color combo too! 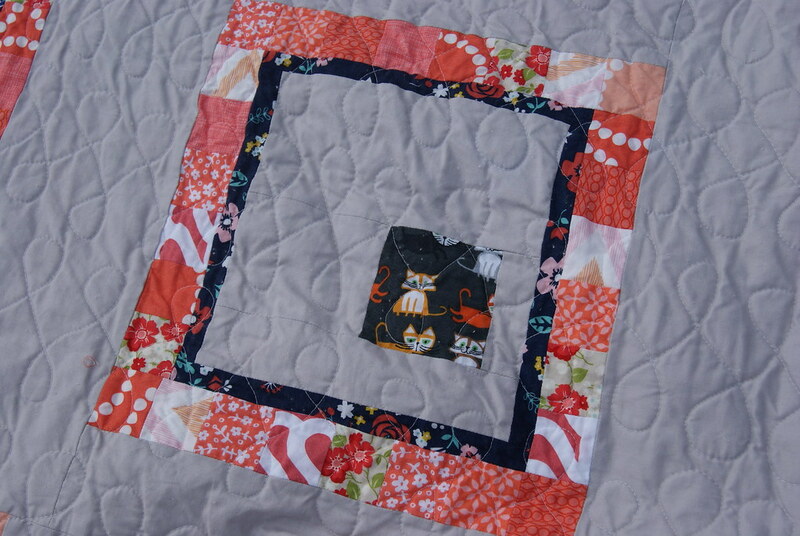 Minky backing is the key for little ones to love quilts. Then again I think we all love soft blankets. It looks great! Gorgeous quilt and isn’t it wonderful to have your hard work so well loved and appreciated. It’s the best reward, I swear! You are braver than I am to try a fleece backing. I love it laura – I have to try minkee! This quilt is gorgeous! It looks soft in pictures so it must be dreamy in real life! Is double-fleece the same as minky or slightly different? I an see why your daughter was so excited to get her little hands on it lol must make your heart happy! Love the peaches and blue color theme. She’s too funny. 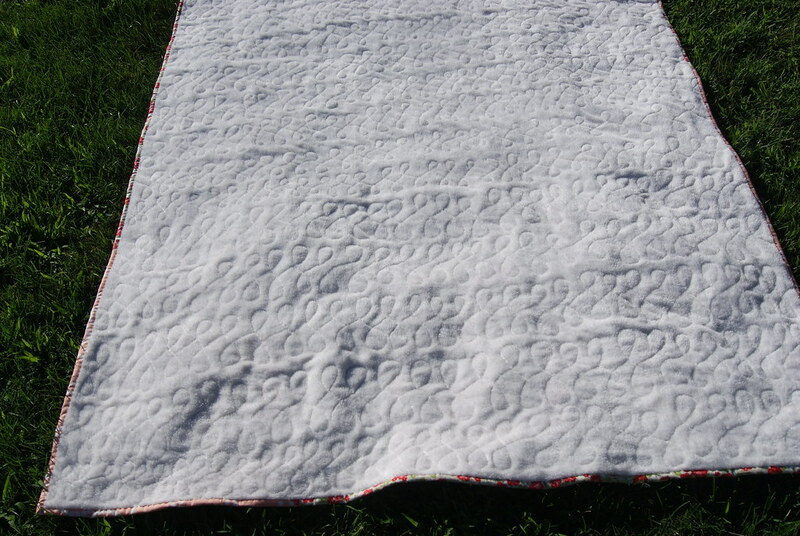 My kids tend to like the fluffier quilts too, so I might try the fleece with no batting. Would probably be good for my boy, who insists on five blankets (it’s his favorite number) and no a/c in the summer (because of the noise). very pretty quilt, and pretty little girl! That’s awesome that she loves her blanket 🙂 How was sewing with Minky? I’ve heard it sheds a ton. What a cute story and well told. My 3 year old (boy) begs to “make a quilt” all the time. Or other times he asks for a “Mommy quilt show” on the computer- Quilty. It looks so good Laura! I love all the fabric choices you made! And you quilted it in one of my two favorite designs!!! Thanks again for doing this! 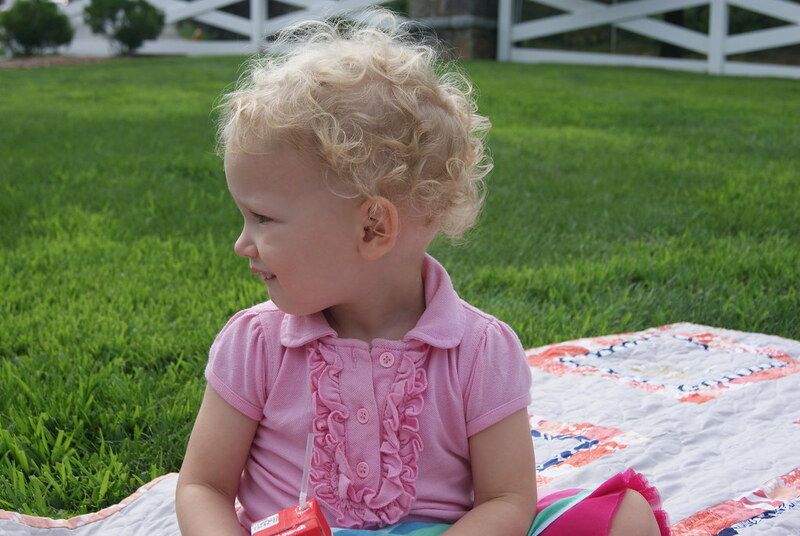 Love the quilt and the curls on your little girl! Kids are so fun to sew for but you never know what reaction you will get. I made my son a backpack for preschool with some adorbs Riley Blake car fabric and he said “Oh, I like fire trucks. Why aren’t there any fire trucks?” Ha! One question for you on the minky – Allison says in her tutorial that she does not prewash her minky. I am not a prewasher for quilt fabric – I was curious if you prewashed your minky first? Thanks for sharing! I think this story is funny and sad. I’m glad she finally has a quilt made by you that she loves! I’ve been thinking of putting minky on my next finish and since your hubby likes it I think the grown ups in my home will love it! I’m not very good at pin basting so ill probably have to spray…where do you get your minky? I saw some awesome cream dots at Joann’s but I heard stories of their flannel shrinking so I wonder if the minky does too….adorable by the way! isn’t that just the best feeling as a Mom? making something that your child just loves so much never gets old. That is a really cute quilt. Love the pattern! Awesome! I’ve never tried minky before, but I have a feeling it would be a winner over here at my place with the kids, too! I love it when my kids love what I make for them! Congrats on the finish! 🙂 Thanks for linking up! 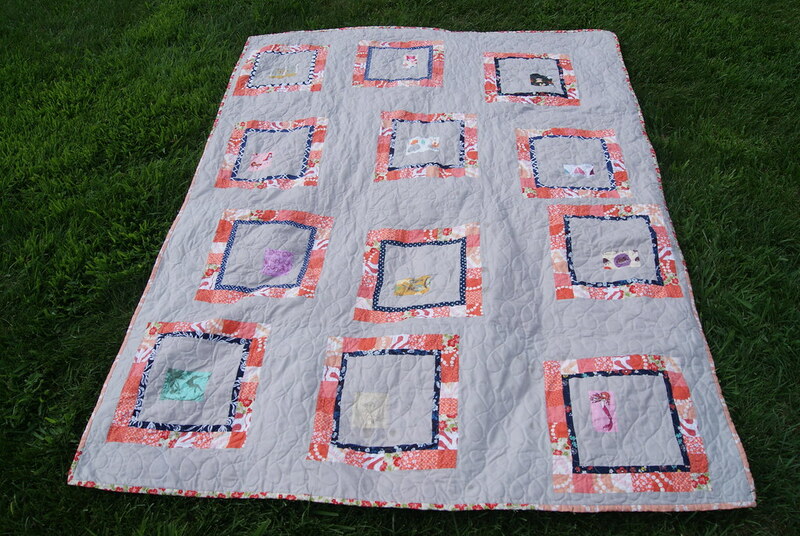 Congratulations on the finish of this very very pretty quilt. But we don’t have to tell you that! The tears of the little girl say enough! This is adorable! It looks so soft and snuggly. I might have to give that minky a try for my next baby quilt. What a sweet quilt and sweet story! I’m going to file away that tip about double sided fleece with no batting. It is gorgeous. I can understand why your daughter loves it so much. I’m working on mine and wanting to finish it so badly. It is a super fun pattern.